Behold the new boss of the world! 1) Outlaw tobacco companies, and train all their employees to work for new, innovative companies that promote smoking cessation and preventive health facilities. Don’t worry, they would all still have jobs: the CEOs could clean the bathrooms. 2) Invent something that would make texting (and talking non-hands-free on a cell phone) impossible while driving. Maybe it would involve an electronic force field that makes cars immune to the technology. I might make something where people could speak text messages, but we’ll see. 4) Manufacture bikes, good walking shoes, and gardens that could feed towns and make things all pretty and easy and better for the planet. I’d get everyone some new comfy shoes, like Kevin Klein’s character did in “The Big Chill.” Happy boxes. Oh yeah, I’ve got lots more where those came from. This entry was posted in Uncategorized and tagged being the boss of the world, bleeding heart liberal, Interdisciplinary Aesthetics, music, nanny state. Bookmark the permalink. I’d hire you! (love the hat)…but can I add a few things to your to-do list? – Take low risk births (=most births) out of hospitals, and have health insurance coverage include doula services. When’s my interview, and what do I wear????? I like the doula thing! 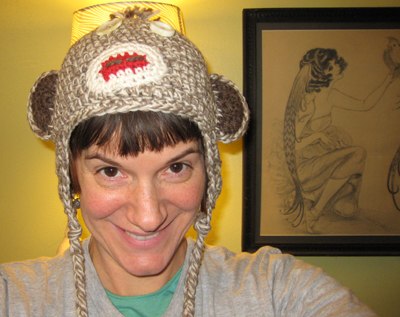 Sock monkey hat=Official headgear of your new boss of the world. I like that.